Despite being just a few miles away from our home, Dernwood Farm feels a world away from the stresses of every day life. 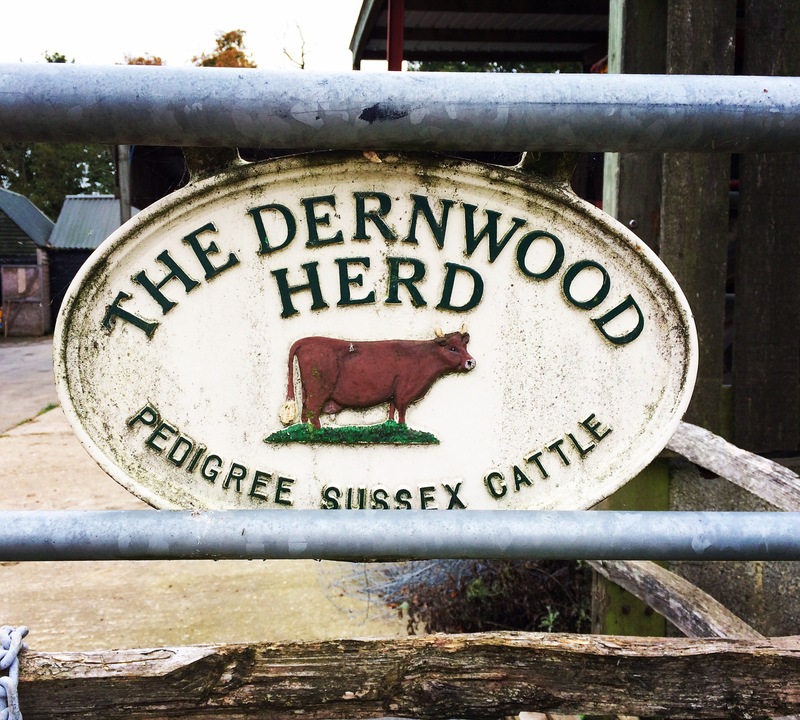 Situated just outside the village of Waldron and hidden down a long, single track country lane Dernwood is an idyllic little corner of Sussex farming life. Run by Amanda Norman and her family the Glamping accommodation is just one element of this traditional working farm where livestock and the farm shop play an equally important role. On arriving at the farm there is a clearly marked area for parking for guests staying on the site. There are plenty of trollies and wheelbarrows making transporting luggage to your accommodation a simple task. 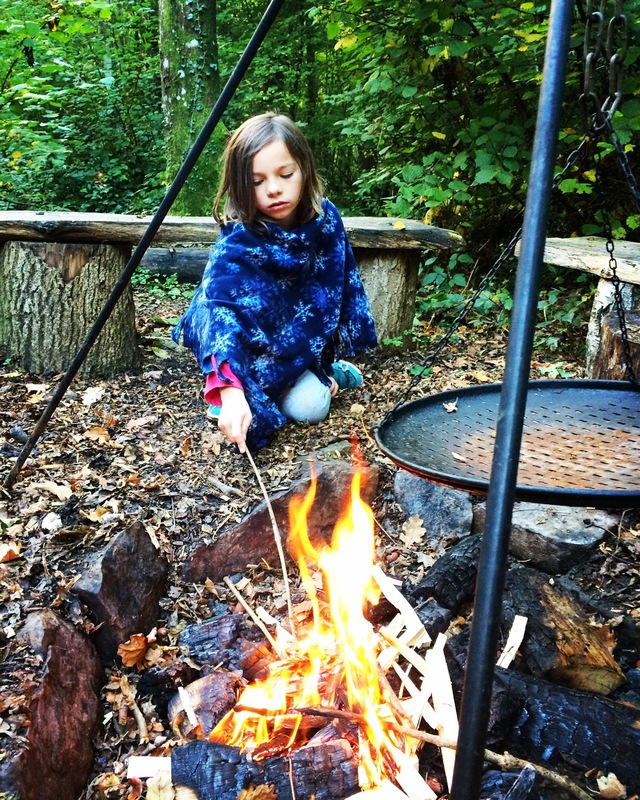 Dernwood Farm Wild Camping offers a range of Glamping and camping facilities, including a safari tent, bell tents and a wagon. 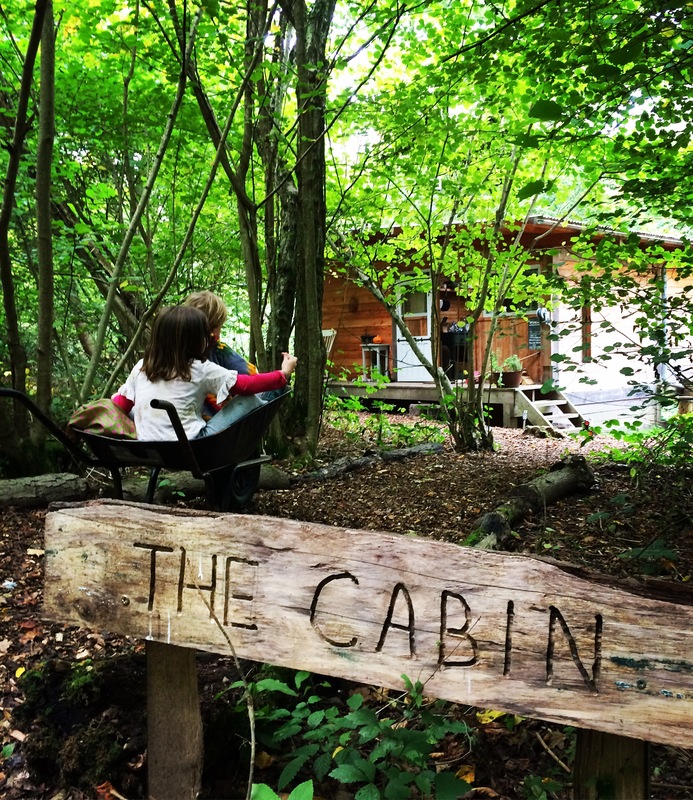 We were thrilled to be staying in the Cabin which was originally a George Clarke project and featured on the Channel 4 show Amazing Spaces in 2014. 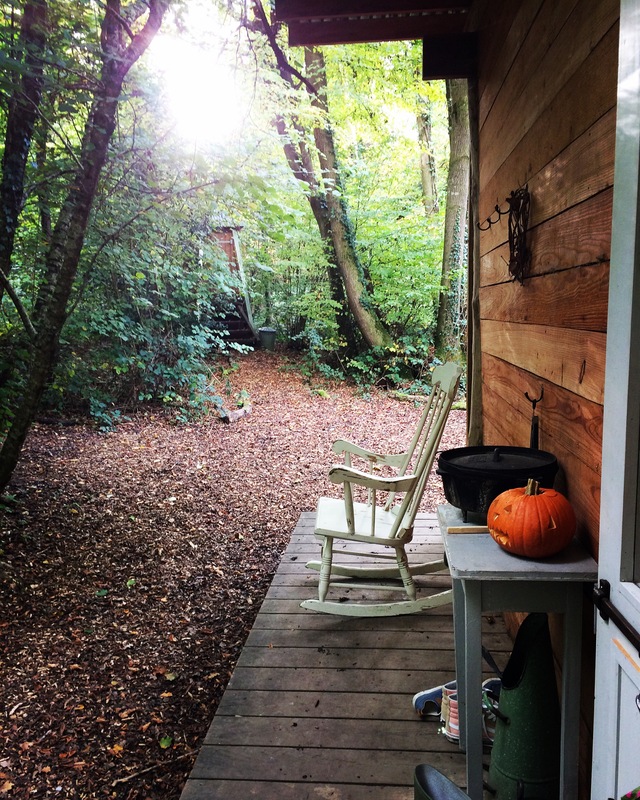 The Cabin is set in secluded woodland a short walk from the main farm. 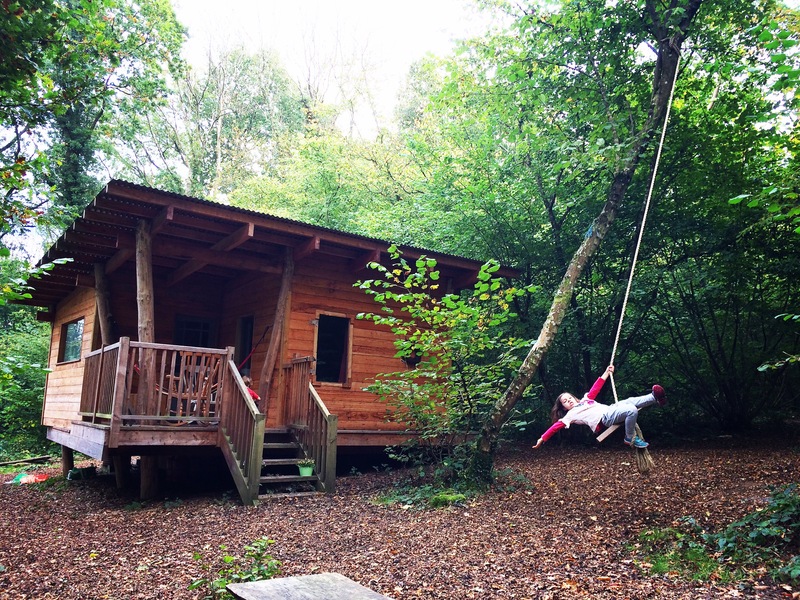 The location really is what makes this place incredibly special and sets the Cabin apart from similar Glamping experiences. Entering the site through the trees the Cabin sits in a large clearing surrounded by large, leafy trees and bathed in shards of sunlight. There is a great sense of seclusion and remoteness that I’m not used to feeling so close to home. 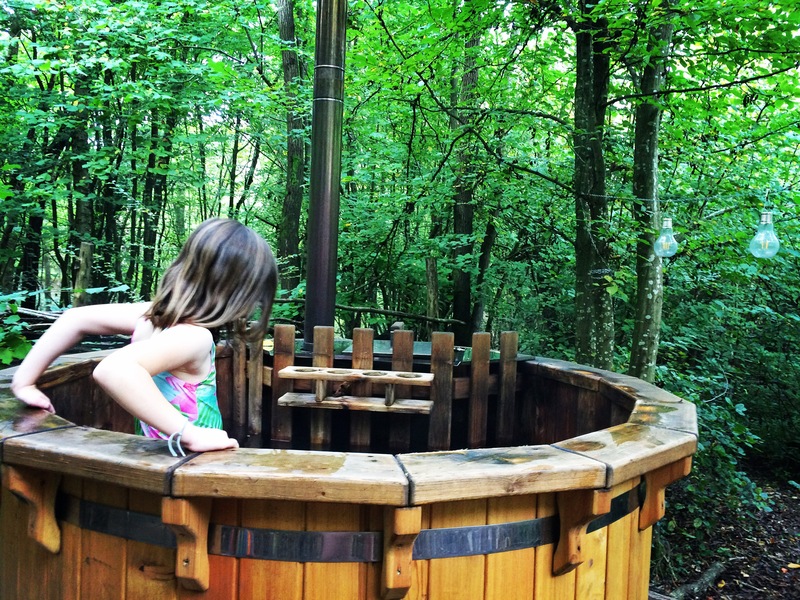 The site comprises of an outdoor cooking area with seating, a self composting drop toilet, a huge rope swing and best of all…a wood fuelled hot tub! 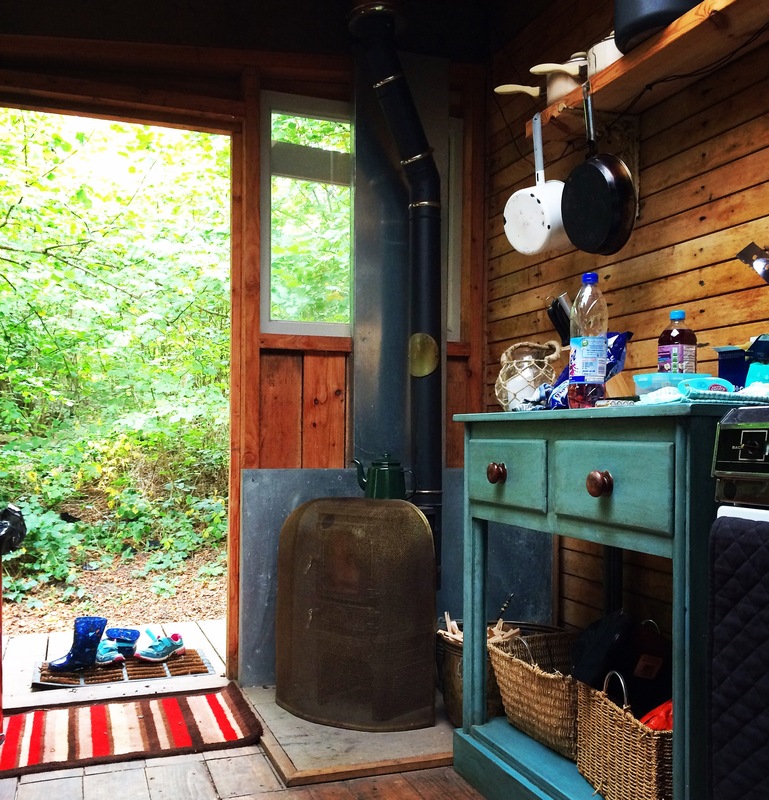 The Cabin is surrounded by a small decking area meaning there’s plenty of space to store muddy boots whilst also creating the ideal spot for a porch hammock and rocking chair. 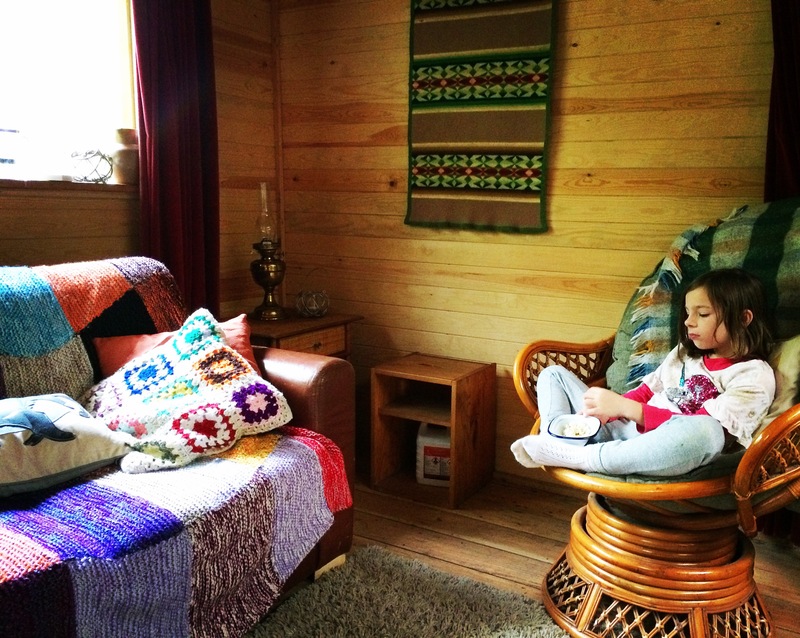 Inside the Cabin there is a generous living space with a small kitchen area, a family dining table and seating area for about four people. There is a separate bedroom with a double / single bunk bed accommodating 3 people. Additional sleeping is available by converting the sofa in the living area into an additional double. Decor is retro and simplistic chic with lighting provided by vintage oil lanterns and the sofa adorned in colourful throws and cushions. There is a small log burner to add the ultimate cosy factor with plenty of kindling and wood provided for the duration of your stay. There is no electricity in the cabin but there’s a gas oven and running water so cooking remains a straight forward task. Food can be kept cool in the large cool box provided. The outdoor cooking area is ideal for evening cook outs with a grill and tripod, ideal for BBQ’s and marshmallows! 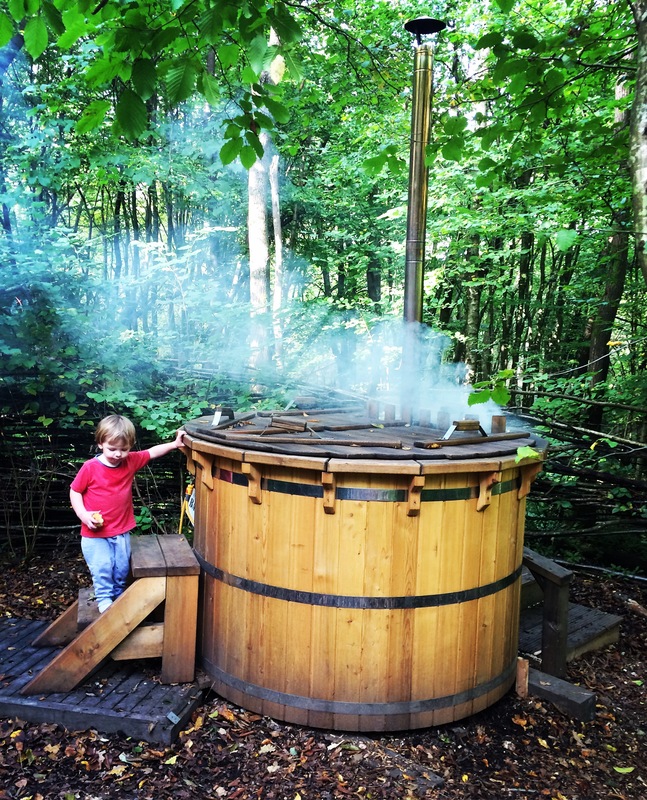 One of the highlights of our stay was bathing the wood fuelled hot tub which is set just behind the main cabin. Again kindling and wood is provided and starting the fire to warm the water is fairly straight. Once the tub has been allowed to heat for a good 2-3 hours the water becomes warm enough to soak in…there’s even a tap for adding cold water should it become too warm. Again the location makes this a truly unique experience, with pretty lanterns and ancient foliage draped over the tub. The perfect way to refresh and unwind. The appeal of the Cabin is absolute escapism. There’s no electricity, no WiFi and there’s very poor phone reception….as a family we spent our time here just being together. The children played on the swing, in the dirt and explored the woodland. 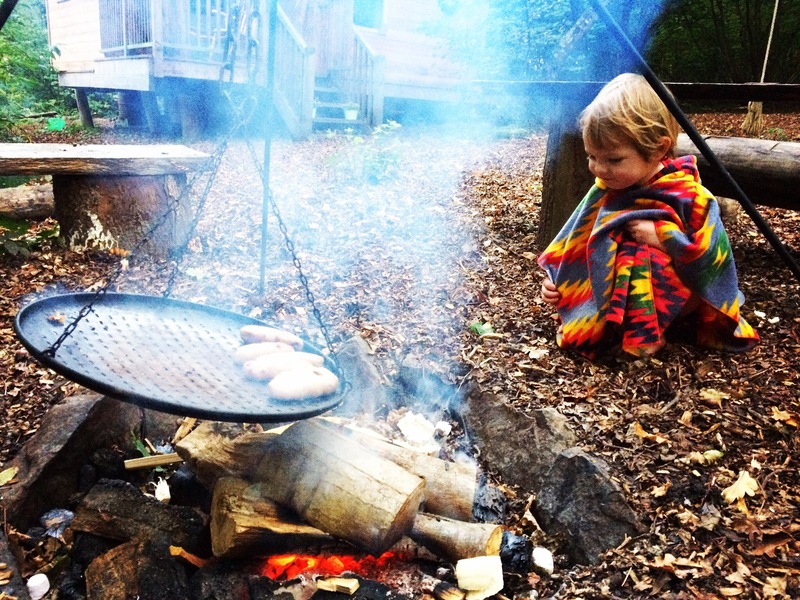 They were fascinated by the fungi, cooking over the fire and learning about simple living. I was really surprised to find that they were extremely happy without their devices and entertainment and time was easily filled. We sang to each other in the hammock and read stories. Things we don’t do enough of at home. 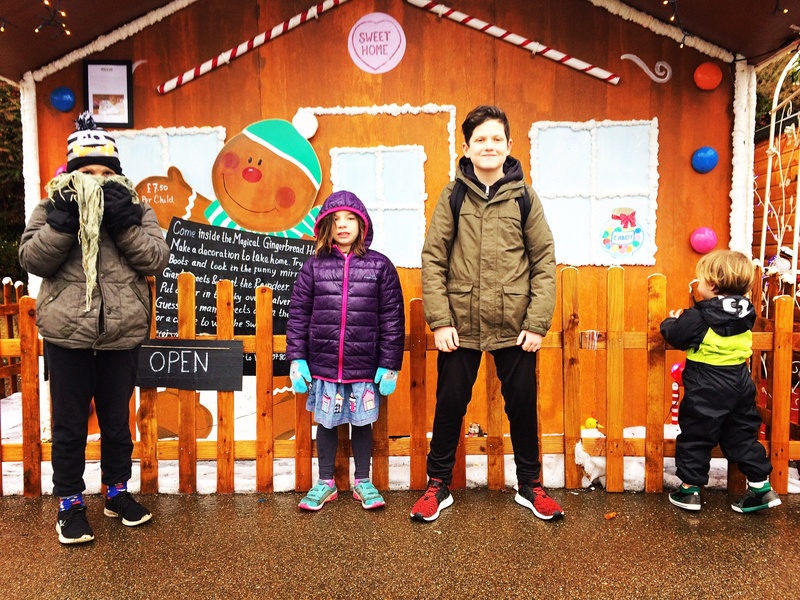 Our time at Dernwood Farm was incredibly special and an experience I will treasure whilst embracing any further opportunities to go wild with the kids! We received a complementary stay at the cabin in exchange for this review. All thoughts and opinions are my own. Thank you to Amanda and her family for inviting us to stay and making us feel so welcome. This really is embracing outdoor life in it’s full. 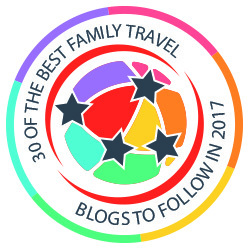 Your photos look lovely and in good weather I should imagine it makes a wonderful family holiday bringing everyone together in nature. 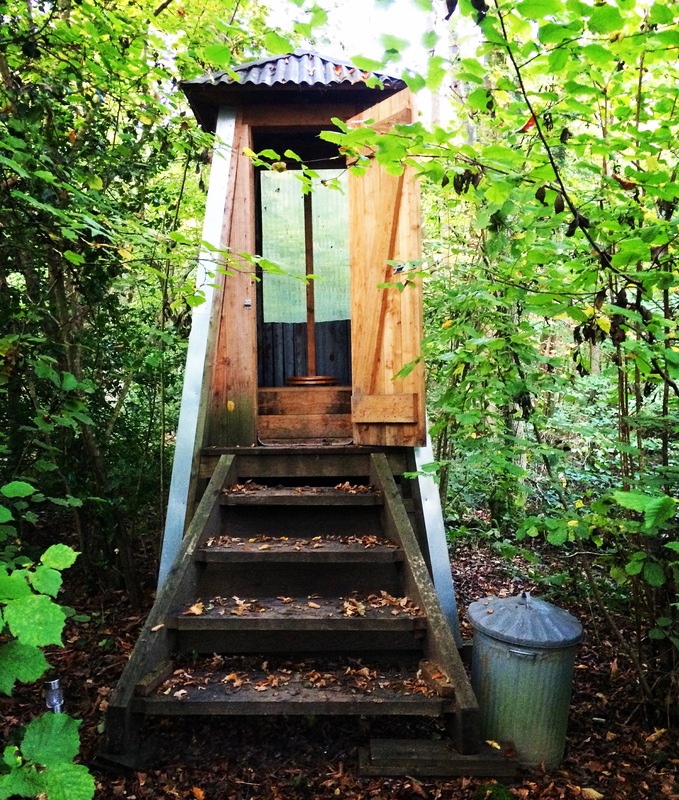 I don’t think the loo would be for me but I love the camp fires and and feeling of being away from it all and the norms of everyday life. is it possible to overheat the water? not sure I fancy being boiled alive or am I being silly? I totally agree that wifi free areas are brilliant for the whole family to connect with none of this checking of social media for 2 minutes that becomes 2 hrs. Ahhh that’s so lovely! Thank you!